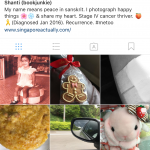 Painfully shy Singaporean, blogging through her mid-life crisis. I yearn to learn something new every day. Started blogging in 2005 and got my own domain, Singapore Actually, in 2011 as I was running out of space for my photos. I write under the pseudonym, bookjunkie, and value my privacy and copyright, but every thought is authentic and me. Now I have found myself on a new journey with ovarian and endometrial cancer and feel a compulsion to share my journey. Is Singapore an urbanite city-island? How do the people in Singapore live and what they do for a living? I stumbled on your very interesting blogs and was hooked on some of your blogs about Singapore. You’re so right James…the whole island is like an urban jungle…the whole country is the city and the city the country, but we do have areas of green as well. Small but it keeps our temperatures from rising. Most Singaporeans seem to work for the civil service and people in the Finance and Insurance industry seem to prosper the most. I was wondering if you knew the companies there that offer a positive work-life balance? Actually that was a really good question. I know of more bad companies than good, with super long working hours and bad office politics. I would love to work at such a place too. Maybe I’ll do a post about this one day asking for recommendations. At the moment dream companies for me would be Google or Apple. I can’t quite remember how I stumbled onto your blog – probably via trawls through the web for stories about the upcoming Presidential Elections – but its been great reading so far…enough to keep me from a basketful of clothes crying out to be ironed. Keep at it, and I’ll be back again! Thanks so much San 🙂 that most kind comment really made my day. I actually want to give up this blog but your encouragement makes me reconsider. Seriously. Please don’t!!!! It’s refreshing (and a relief) to find a blog that I can enjoy for its personal yet constructive views as well as the grammar and syntax. Forgive me if I sound “snobby”, but too many blogs (and posts) are so riddled with typos and grammatical faux pas and/or devoid of punctuation that I stop reading from sheer frustration…so please keep going. Seriously. Happened to pass by here when looking for some PE2011 nomination day happenings. Good blogs you have written and you are writing them with your heart. Seems that you are both concerned and have wishes for the future of Singapore. Not with blind faith. I can say, you are not alone and will not be alone. thank you Szhcornan. Just expressing my simple views. Sometimes I just need to vent. Enjoy reading your blog too. Do continue. hi, I truly enjoyed many of the views you had expressed in your blog. THey are thought provoking and interesting. I am a married 39 year old Indian woman who completely agree with several of your views. Its heartening to realise that you are not alone. As th school exams are over, i have more time to savour your well-written articles. Keep going! thanks so much for the encouraging words santhi 🙂 motivates me to go on on my off days. Googled around n found ur blog. Love it .. Thanks for sharing your experiences via your blog! your comment touched me so much Edi. Thanks so much for taking the trouble to express your feelings about your stay here…your second home now? 🙂 I love learning about new cultures too. Hi, I am not particularly new to Singapore, having lived here for a couple of years before. I am totally enjoying your blog, though I must admit, I have only managed to read a few posts. Some of the things are new and some, very similar to India. I like your simple style of writing and your ability to find happiness in little things. I enjoy your blog. Cannot wait to read more. I didn’t, however, find a tag or post on ‘where to live?’. I’m moving to SG in July. My job will be out in the Woodlands. Any suggestions? Not really an expert on housing but that was a great question. Never thought about it before because I guess I didn’t need to. My first thought is to find a place near an MRT in the central or north area. The West or East would be a bit far I think. This might be a good site for you to check out prices and such. Sembawang is a nice area. Or you could stay at Woodlands itself but apart from being near the causeway and JB, Malaysia it can be a tad crowded. Definitely the whole of Kampong Glam (Arab Street & Haji Lane). It’s my favourite place although sometimes the shops are closed. I think the tend to be open later in the afternoon and evening as the office crowd then comes out. And if you have time after that – Duxton Hill (it’s more for the younger crowd but I loved it – wrote about that very recently too). Hope you have a wonderful time Abbey. There’s a post about what to do in Singapore if you’re here for a week. Wrote it last week. Included Little India as well. Hi! LOVE your blog! I have been researching places to visit while my husband, son & I travel there next month. Your blog is full of interesting tidbits & I have added several places to stop on our visit. Thank you! Hello! You have a great blog! I am from a local book distribution company, and would like to work with you on book reviews. Please do contact me at my email address should you be keen! Many thanks in advance! hope it hasn’t been too bad for you. glad if the blog helps a bit 🙂 And thanks so much for reading. Chanced upon your blog and as you can see have enjoyed it so much that I’m following 🙂 As a repatriate of sorts who grew up in Singapore your blog definitely gives me a strong sense of nostalgia, and I see that as a good thing! I am so glad you feel that way. Thank you so much for your kind words. Inspires me to continue to keep writing in this public diary of sorts. Hey, I thought we may meet for a meal one day? Can you email me at rubbisheatrubbishgrow@gmail.com please? take me to Indian food at the hawker you love! I’m so sorry that I’m so reclusive and shy…but I appreciate the thought…will take a raincheque till the day I’m ‘unshy’? Of course. 🙂 Hope to see you one day. thanks for coming by…love your visits here. Hello there, I’m Wilson (aka gurkhason) from Thoughts on Air. Thank you for your pingback on my post of Sophie Bakery. Yes, they don’t have a seat there and you can see the choices are really limited for now. I enjoyed reading your blog. They are informative, entertaining and interesting. Keep the good blogs coming! Hi Bookjunkie! I stumbled upon your blog while trawling other blogs in the past week. Your posts transport me back home when I’m feeling homesick and I really enjoy reading them! I am a fellow Singaporean but have recently moved away with my husband for an overseas posting. I’m a little like you. I love to write and I used to journal regular in the form of long letters to friends and family when I was a student studying overseas (that was eons ago!). Somehow, I lost touch with writing and as much as I would love to start again, I don’t seem to be able to write as well as the bloggers out there (just like you!). Maybe I’m just too haphazard. No plan, no structure. Maybe I should attempt to start journalling again just so my new experiences and adventure will not be forgotten! Oh and thanks for such a wonderful blog! Please keep writing! You’re so sweet Cheryl…thank you sooo much 🙂 I’d love to read your blog too. We are a Singapore magazine . We saw your blog , and feel you are very suitable to do our ” editorial consultant .” Specific work items is for us to see our school English articles ( many of which are Chinese translated into English ) , please be assured that two months time you need proof 40 manuscript . 1, put your signature ( editorial consultant ) on the copyright page . 2 , when you see the article in the school put on your CREDIT. 3 , each send two magazines to you. 4 , you can open the magazine columns, and can be up to a maximum of two . The title of the article and you can be on the cover exposed. 5 , Do you have any other things we need to promote , and we can discuss all say. If you are interested , please write back , we go into the details . founded in 2006 , is Singapore’s local magazine , bi-monthly in English , concerned about the health of older elites live audience is between 40-60 years of age , in addition to health, this age group are concerned about a lifestyle we will report , such as tourism , fashion , beauty, feng shui , pets, emotions and so on. Currently editor in chief of Taiwan’s former editor DAVID WANG. Is now the largest selling health magazine in Singapore , one of the island bookstores, newsstands and convenience stores have sold. Hi, you have a very nice blog, I’ve been following it on and off for more than a year now, I like how you are showing the places to visit in sg, it shows me kind of like the everyday stuffs which I like, the places to go, the things to eat, your pictures are very descriptive of the places you’ve been to also. Please keep it going. I also like to ask which theme are you using in wordpress too? Thanks so much. I’m using the standard wordpress theme from 2011 I think. Hello, I can’t remember how long ago I have been reading your blog. I remember I stumbled upon it while checking out what to do in Singapore. I have been there at least once a year since 2012 and it has always been a fun experience. There was a time you were very quiet and I though maybe you no longer felt like writing but when you started and talked about what you have been going through then I understood the absence. I, too, have been a regular reader for some time. When I noticed a lull in your posts I assumed that you had found other pursuits (and I felt happy for you). I was saddened by the news of your illness. Sending you warm wishes, M.
I stumbled upon your blog as I am going through a path same as yours. Battling recurrent stage 3 cancer and been writing all thoughts in my head. As I have been trying to think this exactly but couldn’t find the words for it. thank you….sorry have been away for a long time.